AOR™ guarantees that only ingredients listed on the label have been added to the product. Contains no wheat, gluten, corn, nuts, peanuts, sesame seeds, sulphites, mustard, soy, dairy, eggs, fish, shellfish or any animal byproduct. 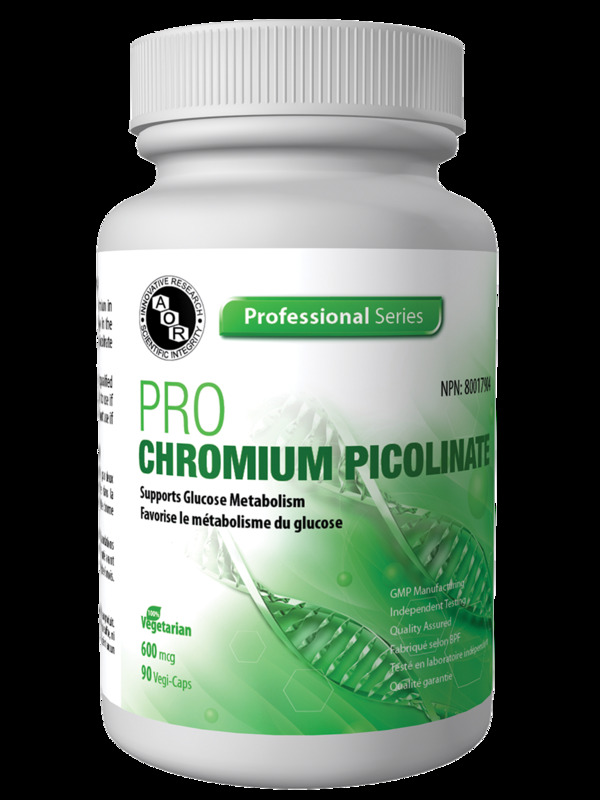 What is Pro Chromium Picolinate? Chromium is an essential trace mineral. Its most important function is maintaining healthy levels of blood sugar. This is particularly important for individuals with impaired insulin function. Chromium enhances the roles of insulin, allowing insulin to travel through the body and control blood sugar levels. Chromium picolinate is trivalent chromium with picolinic acid.A superior form of chromium picolinate is a bidendate chelate with picolinic acid. Research has suggested that chromium picolinate is the natural form of chromium in living things. It is this supplemental form that has shown benefits in clinical trials. AOR's formula provides an effective dose of this important nutrient to keep glucose under control. Suggested Use: Take 1 capsule daily with/without food. Cautions: Caution prior to use in patients with a kidney disorder or for use beyond 6 months.